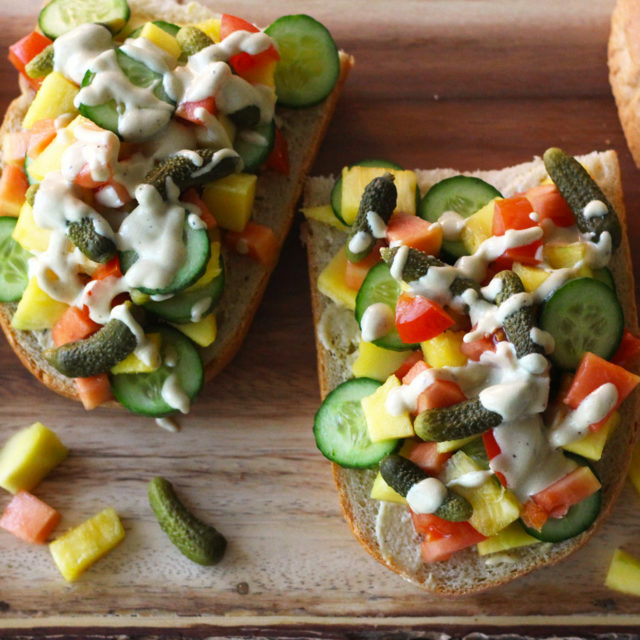 This sandwich brings all the flavors of a tropical paradise together on a soft baguette, complemented by tangy, sour pickles, and juicy cucumbers and tomatoes. 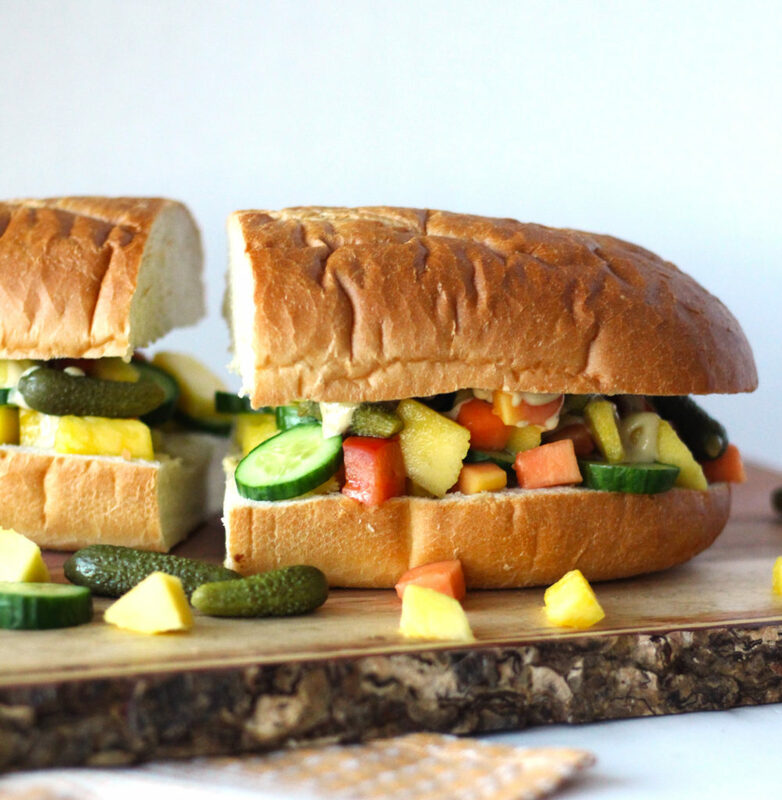 The tropical fruit sandwich comes together when dressed in a creamy, vegan French vinaigrette. 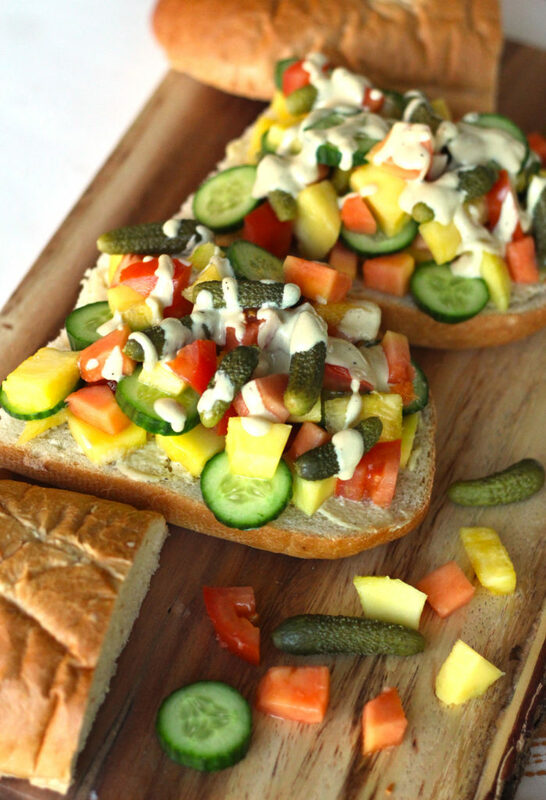 This recipe was inspired by the famous tropical sandwich at Miami’s La Sandwicherie. Once I heard about this deliciously simple sandwich, I had to recreate my own version to enjoy in the comfort of my home. The vibrant colors of all the toppings on this sandwich brighten my mood like a rainbow, especially during these cold fall and winter months. The flavors take me to a tropical escape, somewhere on a beach where it is not rainy, cold, and dark at 4pm. I was amazed by how well the tangy pickles compliment the sweetness of the tropical fruits! The dressing helps the seemingly opposite flavors to complement each other. 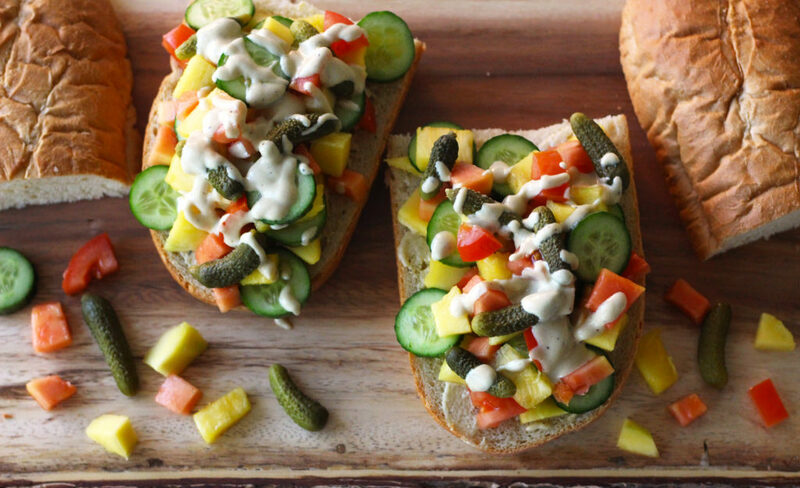 This sandwich comes together in minutes! All you need to do is chop up the fresh fruits, pile them as high as you can on your favorite fluffy baguette, and whisk the simple vinaigrette together to top it all off. I hope you enjoy this recipe as much as I do! Don’t forget to let me know if you try this in the comments below. And I would love to see your recreations on Instagram @zenanzaatar! ???? A vegan tropical fruit sandwich inspired by the famous tropical sandwich at Miami's La Sandwicherie. 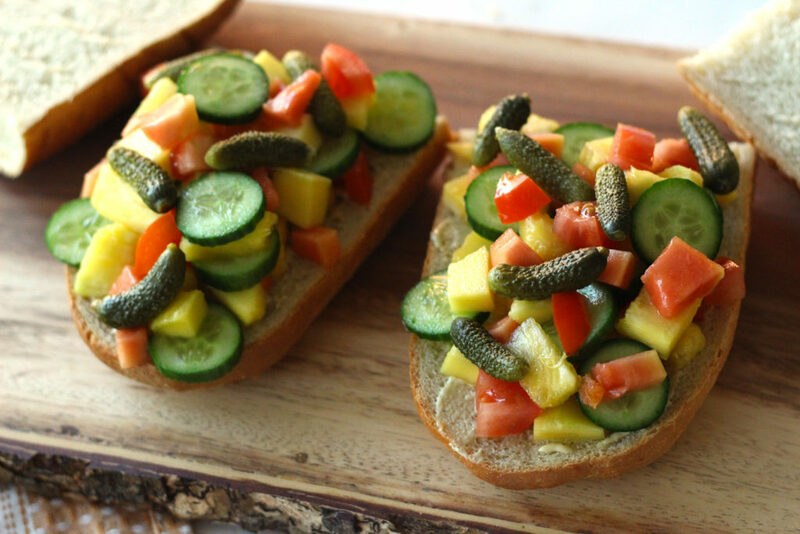 Soft baguette filled with papaya, pineapple, mango, cucumber, tomato, and tangy French pickles. Drizzled with a creamy French vinaigrette. Cut baguette into desired number of sandwiches and slice lengthwise. If there is not much area for filling on the baguette, scoop out a small amount of the bottom half to fill with toppings. Dice all the necessary fruits and set aside. Prepare the vinaigrette. In a small bowl, whisk tahini and vinegar together. Whisk in water to thin. Whisk in remaining ingredients until smooth, and add salt and pepper to taste. Spread vinaigrette over each half of each sandwich. 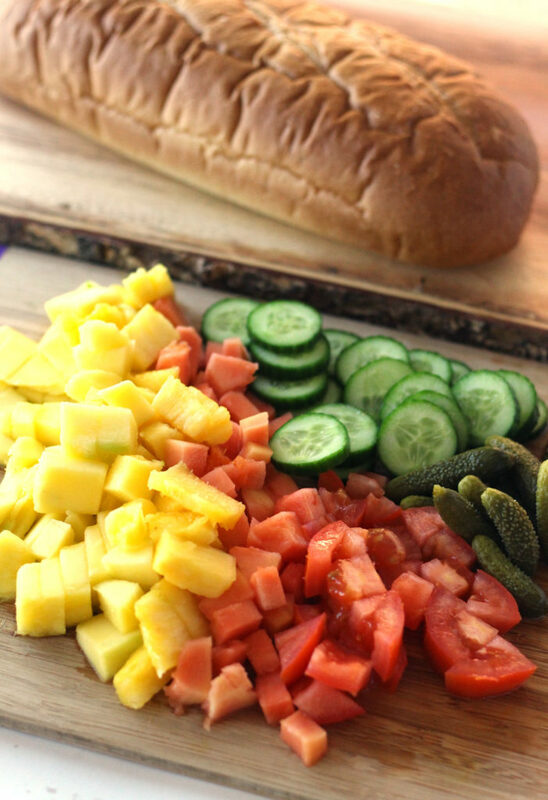 Fill with an assortment of mango, papaya, pineapple, cucumbers, tomatoes, and cornichons. Drizzle with extra vinaigrette. Serve immediately.